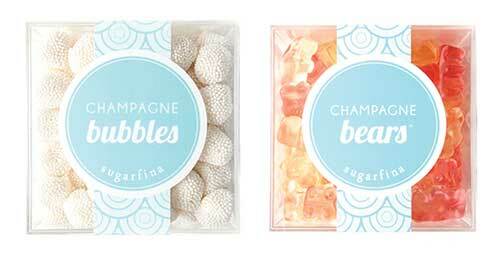 Rosie O'Neill and Josh Resnick started Sugarfina in 2012 in Los Angeles. Since that time they've opened boutiques across the country, including the South. All the candies are sourced globally from their frequent travels and endless tastings with the best artisan candymakers. From top left find Gingerbread Caramels and Peppermint Malt Balls made in the USA, Ice Cream Cones fom Germany and Bella Rosa from Italy. There are hundreds of incredible candies to choose from, which is why I spent way too much time on their site the other day. In this set you'll find Fuji Apple Caramels, Candy Cane Caramels, Key Lime Pie Cookie Bites, and these Sugar Cookies whose description reads as follows: "A teeny tiny sugar cookie is dipped in white chocolate, then sprinkled with superfine sugar." Be still my heart. To make your next holiday party sweet and memorable, just click here or here to find where the Southern shops are.